Next up for our all too brief series of Martha Sigall’s “Tales from Termite Terrace and Other Tooneries”, is a chat between ink and paint artists Karen Storr and Mercedes Hoffman. 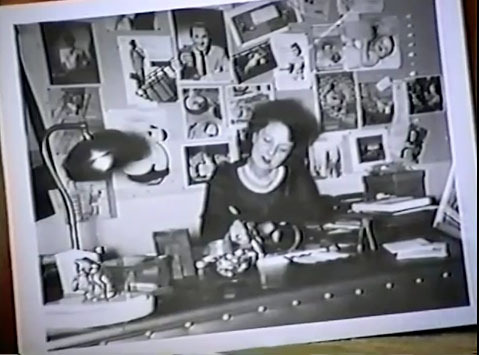 The occasion for video conversation, recorded on September 12, 1999, seems to have been the recent 99th birthday party held for Hoffman; her career in animation was not as lengthy as her age suggests, having only begun working in the industry, at Warner Bros., about 1956, which indicates she was about 56 when she began. Storr says little about her own career in the business, which began about 10 years after Hoffman’s. However, she does mention the circumstances under which she became president of the Motion Picture Screen Cartoonists (today’s Animation Guild), succeeding Moe Gollub, mentioning briefly her responsibility for launching the Golden Awards Banquets. Storr relates an interesting tale of what happened when she was attending a lunchtime Christmas party at the Tahitian Room and forgot to go back to work at Hanna-Barbera. “Mr. Hanna” then shows up, starts paying for drinks all around and “starts dancing with all the girls.” Storr was apparently not held accountable for not returning to work that afternoon. Hoffman seemed rather reticent about discussing her pre-animation career, except that involved being in vaudeville, where she “carried around a conversation and sang.” She entered the business at the tail end of the Golden Age and was delighted to have worked under Friz Freleng, Bob McKimson and Chuck Jones. However, most of her toon stories seem to relate to her extended stay at Hanna-Barbera. She and Storr exchange several anecdotes about working at the studio and the rather relaxed atmosphere that seems suggestive of the Golden Age studios, such as Warner Bros. and MGM, than the stereotype of a TV cartoon factory. Storr also points out the surprisingly varied pre-animation careers of a number of ink and paint artists, including Lavelle Haines as a Goldwyn Girl, and Catherine Victor, who played Cat Woman. I found a reference to Ms Hoffman performing in “Delirious Day” at the Show House on Wilshire and Hauser and “Under the Gaslight” at the Ardin’s Music Hall in Hollywood, both in 1934. In 1956, she was in the stage drama “The Comedian,” which also had Bob Denver way, way down in the cast list. She did some stage work after Hanna-Barbera; Variety mentions her in a musical revue at the Burbank Little Theatre in 1969. She mentions Roberta. Roberta Greutert was the head of ink and paint at H-B at the outset and had been the assistant head of the department at MGM when it closed. Does anyone have any idea wwhich studio produced this particlauar ad. It might be Hubley or Murakumi Wolf I am Not Sure. Please Help Me.